GoodFarms has been working with the county of Monterey, California to provide our team members and their families with healthier meals. 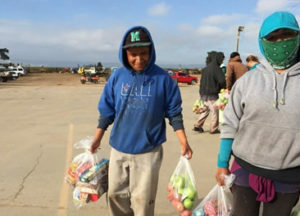 The county’s food bank has a program where they work with agricultural companies to deliver healthy food at convenient times for farmworkers, who otherwise wouldn’t be able to get to the food bank before closing. We ask for and receive enough food for 200 people every month through this program, which puts to good use nutritious food that would otherwise likely go to waste. The food comes at no cost to our team members, who only need to fill out a simple sign-up sheet to enroll. Each person receives three servings of breads/grains, a bag of fruits and vegetables, a bag of canned and dry goods, and sometimes frozen chicken or beef. The food is kept fresh in our cooler until it is ready to be picked up at the end of the workday. The Food Bank for Monterey County is a member of Feeding America, an organization we donate to that helps supply needy families with healthy food, while also helping to prevent the needless waste of food.